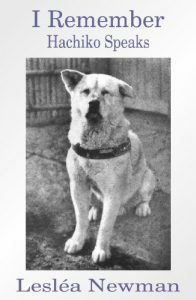 A chapbook of poetry told in the voice of Hachiko, Japan’s famous Akita, as an old dog looking back on his life. Hachiko was born in 1935 and owned by Professor Eisaburo Ueno. Every day he accompanied his master to the train station, ran home, and returned to meet him at the end of the day. One day, the Professor did not return. Hachiko waited for 10 long years, hoping to be reunited with his master. Based on the same true story as Lesléa Newman’s children’s book, Hachiko Waits, and the movie Hachi: A Dog’s Tale, starring Richard Gere and Joan Allen. What had become of the one I call Master? Deep in my bones I knew something was wrong.